Still exploring around in the kitchen. It's daunting to approach dinner with a cookbook because you need to have a lot of key ingredients to begin with. Having virtually no spices (aside from salt, pepper, and basil) -- I've started to approach meals completely from scratch, and it isn't half-bad. 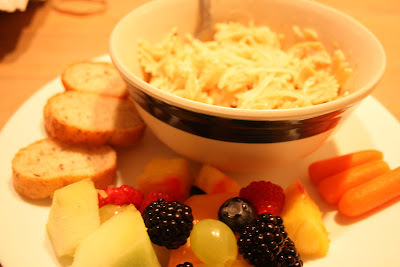 Last night I had bow-tie pasta with chicken and a basil lemon-cream sauce, fruit salad, and french bread with olive oil. Orange juice on the side. There's supposed to be some website where you can type in the ingredients you have, and it generates a recipe for your list. I've heard the ladies at work talking about it, and I've been trying to find it for a while. Does anyone know it? 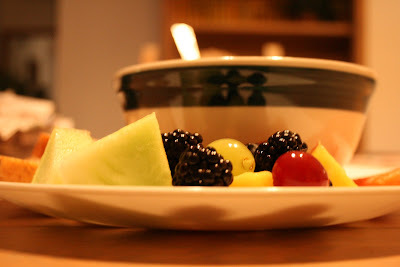 These SadBear posts about food always make me either hungry or want to do a food post of my own. I'll start documenting my staple dishes soon. Chris, I think the website you're talking about is SuperCook.com. It's not perfect, but it's a good concept. I wish there were a way to create different profiles (i.e. separate ingredient lists) under the same account, so that you can restrict certain ingredients for specific dietary preferences. For example, you could have a vegan ingredient list distinct from your full ingredient list. This would be helpful for someone like me, who only eats meat a few times a week. To answer Chase's question, I haven't made anything in a while. Cooking isn't worth the effort for me, so I pretty much eat 80% fresh fruit now, with spinach, romaine, plus nuts and vegetables. I have meat 2-3 times a week, most often if I'm at someone's house or in a restaurant. But I don't do any kind of meal prep at all -- that includes cooking, and even simple things like salads. I guess I'm content to munch on fresh produce. Tony and I haven't cooked anything in weeks (and we haven't done dishes either, which has made us want to cook even less). We've been too busy getting ready for the wedding, so we've eaten out for almost every meal lately. I'm looking forward to getting back to cooking after the wedding though.